We love the tranquil feeling of this Coastal bedding set. 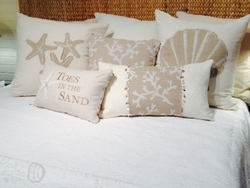 This set includes 1 queen white matelasse' quilt, 2 large pillows (one Starfish and 1 One Seashell) 1 small embroidered pillow with Seashell trim and 1 oblong Coral pillow with real Seashell trim. The Seashell quilt measures 90x92. The large Starfish and Seashell Pillows measure 22x22. The small embroidered Pillow measures aproximately 12x18 and has real seashell trim on the sides. The oblong Coral Pillow measures aproximately 13x22. All made from Beautiful designer quality fabrics and trim. Made exclusively by Home By The Seashore here in Seal Beach California. All items pictured here are available individually.